You and your church can reach out to your neighbors, acquaintances and friends this Christmas, especially those born in another country, with the JESUS DVD in their own language. YOU can ensure no cultural difference nor language barrier stands in the way of everyone hearing the story of Jesus. Give the gift that carries the potential to lead those around you, and their families, to a decision to give their lives to Christ! 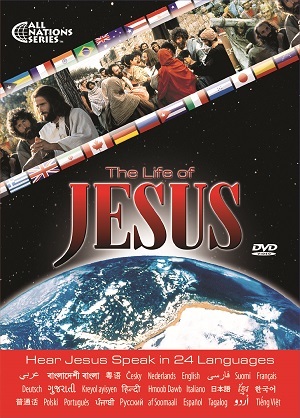 With a DVD including up to 24 languages for only $1 each, YOU can truly give the story of Jesus to everyone you know. Make sure this is the Christmas that no one is left off your list and help welcome every nation into His kingdom. "I would like to give you a gift." "This DVD has the story of Christmas in your language." "Is your language one of those listed on this DVD?" Also available is the DVD below for children in 24 languages – 100 DVDs for $100. 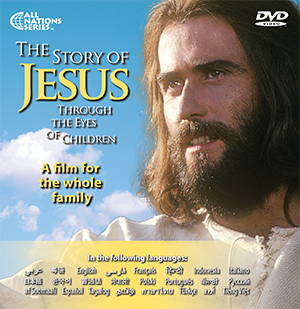 The Story of Jesus Through the Eyes of Children with audio in 24 languages: Arabic, Cantonese, English, Farsi (Persian), French, Hindi, Indonesian, Italian, Japanese, Korean, Mandarin, Nepali, Polish, Portuguese (Brazilian), Punjabi, Russian, Somali, Spanish (Latin American), Tagalog, Tamil, Thai, Turkish, Urdu and Vietnamese. Orders will be shipped on a first-come, first-serve basis until all stock is depleted. Offer the DVD to immigrants and watch their eyes light up at seeing their own language listed. If appropriate, give them your contact information and be available to answer their questions. Or, you may invite them to your home to watch the DVD together. Watch it in their language with English subtitles. After they watch the DVD, consider asking them what they thought of the film and if the prayer made sense to them. Offer to bring them a New Testament in their language. Carry DVDs with you and keep some in your car so you will always be ready to give the gift of JESUS. Ask God to make you aware of people you meet every day who are from other countries.